One of my favorite things about living in the city of Lancaster Pennsylvania is taking my dog Bella to a beautiful off leash dog park. It’s actually one of the 10 best dog parks in the USA. The Purina Beneful dog park — aka Beau’s Dream Dog Park at Buchanan Park — is THE place to exercise your dog. 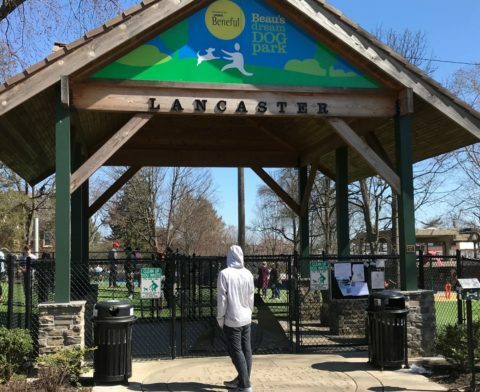 A local resident (Angela) and her dog (Beau) won the Beneful Dream Dog Park contest that brought a $500,000 makeover to Lancaster’s Buchanan Dog Park. Here’s everything you need to know before visiting this off-leash dog park, plus some handy tips that you can use at any dog park. I appreciate the double entry gates — because they provide a good place to take your dog off of the leash before the other dogs come charging toward the newest guest. The downside of double gates: It can cause the dogs to get even more excited in anticipation of entry into the dog park. The humans sometimes find the double-gates difficult to manage with multiple dogs or things in their hands — which causes a delay in entering or exiting the dog park. MY BEST TIP: It’s helpful to use a dog fanny pack when going places with your dog. A hands-free tote makes it easier to carry small items, plus you’ll always have at least one hand free! A dog trainer shares some excellent tips for socializing your dog with other dogs. If you’re anything like me, part of the reason you take your dog to an off-leash dog park is to let them release their energy and provide a break for you. Of course, there are other reasons too (like exercise and socialization), but it’s nice not to have to throw the ball for an hour non-stop… am I right? The downside of the tennis ball launcher: I know it works because I have seen photos of dogs using it, but it is broken… a lot. I called the number online and left a voicemail trying to get it fixed — but didn’t get a return call. MY BEST TIP: Just let your dog run around. Don’t worry about bringing frisbees and other retrievable dog toys to this dog park. Save those for the beautiful open grounds of Buchanan Park. Have extra tennis balls at home? Here are some great DIY dog toy ideas you can make from tennis balls! You’ve probably seen the kiddie parks where water “shoots” up from the ground. Beau’s off-leash dog park has the same type of thing! The water sprays the dog from the underside — which is awesome for those hot dog days of summer. The downside of a dog splash pad: Kids think it’s for them — so when they scream, shout, and play in it… the dogs don’t. The splash pad at the Buchanan Park dog park should be reserved for dog use only, but not everyone follows the rules. MY BEST TIP: Bring a towel to dry off your dog before you put them back in your car, and don’t wear your Sunday best to the dog park. Prepare to get wet and perhaps a little dirty when you’re there! Here are some ways to keep your dog happy in the summer heat. You don’t have to bring your own dog water bowls with you to the Buchanan Park dog park — because they have large water bowls and doggie water fountains within the gates. The downside of shared water bowls: Some people fear that sharing water bowls exposes dogs to more contagious diseases — like parvovirus and the canine papilloma virus since these dog illnesses can spread through saliva. So if a dog sneezes at the bowl, other dogs may be exposed. MY BEST TIP: I usually keep water in my car and try to discourage Bella from drinking out of the shared bowls at dog parks — since she actually has picked up a couple of illnesses in the past (that may have been related to the dog park). Here are some more facts about transferable canine illnesses. This is probably my favorite feature of this particular off-leash dog park. Both the large breed side and small dog side have ample room for the dogs to run and play. 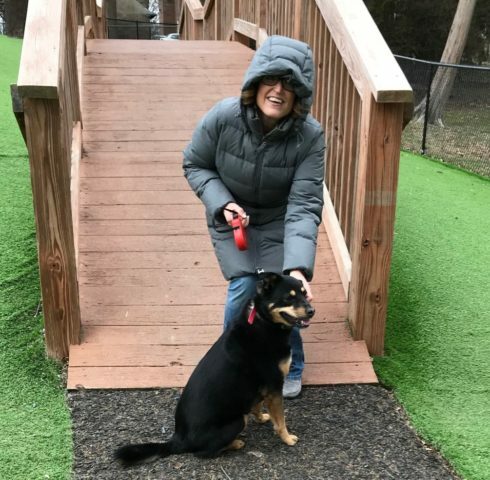 Many dog owners assume that dog parks are only for large breeds — so the fact that this one is dedicated to all sized breeds makes it very attractive. The downside of having 2 different size dog parks: Because there aren’t specific rules about the size/weight of dogs that are allowed on either side of the Beneful dog park, this leaves it open to interpretation by the owners/handlers. Sometimes dog owners will allow large dogs in the small dog side and small dogs in the large dog side — which results in the smaller dogs being trampled at times. MY BEST TIP: Know your dog and look at the sizes of the dogs in each area before deciding where your dog will be the most comfortable. This could vary each time you visit the park. Here are the dangers of allowing large breeds and small breeds to play together. There are very comfortable chairs for the human visitors that are covered by bright awnings — to keep the sun at bay. They are great! I find that I stay at this dog park longer, since I can sit down and relax. The downside of cozy chairs and an awning: Again, it’s the humans that struggle with this — many sit down with their cellphones and never pay attention to their dogs. Therefore, some miss when their dog goes to the bathroom right in the middle of the park or is aggressive towards another dog. Also, people tend to bring food in (even though it clearly states on the rules that you shouldn’t) and that can cause problems. MY BEST TIP: Pay attention to your dog at all times. Use this time to interact with your dog and socialize with the other dog owners that are there. This makes it more enjoyable for everyone at the dog park. Here are some really good tips for review before you go to a dog park. There are many visible and easily accessible receptacles and bags to take care of doggie accidents — both inside and outside of the dog park. There really is no excuse for owners not picking up after their dogs, but it does happen sometimes. 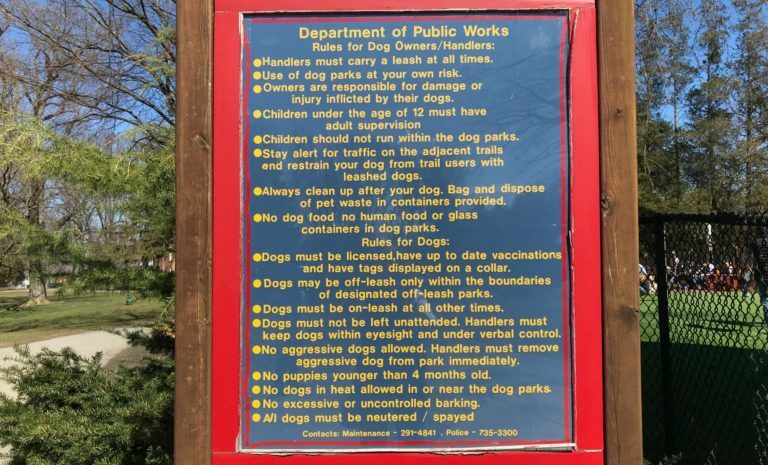 The downside of clean-up stations: During the hot summer months, the receptacles at the entrance to this off-leash dog park can get very full (and hot) — and the stench is less than favorable. MY BEST TIP: Bring extra disposable grocery store bags with you or a portable poop scoop — just in case the clean-up stations are out of bags or there’s a huge mess in a popular play area where someone else hasn’t picked up after their dog. Here are some reasons you should really clean up after your dog — even in your own yard! Beau’s off-leash dog park in Buchanan Park is a great place to visit if you’re traveling to or through Lancaster, PA. The above tips could actually be used before you head out to any dog park. Here are 5 more tips before you take your dog to an off-leash dog park for the first time. Interact with your dog and the other owners while you’re there. Following these tips will ensure a safer and more enjoyable time for you and your pet.